The Scorpion HD Mini ATV is the ultimate utility vehicle. 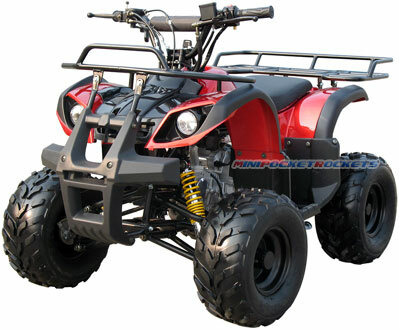 Standing much larger than a regular Mini ATV, the Scorpion HD features a higher ground clearance, front and rear alloy steel tubular storage racks and an impact resistant ABS bumper. 16" Mudslinger XT All-Terrain Tires, extra-long suspension travel and a 3.78L gas tank means that this ATV can carry more payload and go where other Mini ATVs cannot. The Honda®-Based 4-Stroke powerplant comes in two configurations: The standard 110cc engine and an optional 125cc variant that provides even more power and torque. The base 110cc motor provides more than enough displacement to tackle any obstacle in your way. But if you plan on hauling heavy loads, or just crave that extra power, then the 125cc engine should be your weapon of choice. The Double A-Arm and Multi-point trailing arm rear suspension system has been tuned for HD (Heavy-Duty) off-roading and hauling. The fully automatic centrifugal transmission comes with an optional Reverse Gear to help you back out of sticky situations ( Reverse is only available with our 125cc ATV models ). HD dual front brakes and a hydraulic rear disc brake with foot pedal provides stopping power in all kinds of weather and trail conditions. Extra-wide ABS fenders and impact resistant body and foot guards protect you and your Mini ATV from the elements. Dual front headlights blaze the way for you in the darkest of nights, while the rear tail lamp and brake light lets you be seen from up to a mile away. And like all of our Mini ATVs, the Scorpion HD sports Electric Push Button Start / Stop with keyed ignition, ZR-X Alternator, sealed waterproof battery, Remote Controlled Auto Shut-Off with 30+ foot range and an adjustable Speed Governor that can dial top speed down to 5 mph. Connect the battery, attach the wheels, fill up the tank with gasoline and you are ready to ride. Designed and built for Heavy Duty trekking, the Scorpion HD Mini ATV is perfectly suited for the roughest terrain and the toughest of missions! EPA APPROVED - OUR MINI ATV IS EPA APPROVED, LEGAL TO REGISTER IN ALL 50 STATES! Included Free with Scorpion HD Mini ATV: Tools, Ignition Keys (2), Charger, Remote Control, Registration Papers / Title of Ownership, Owner's Manual, Informational DVD and our free extended warranty.